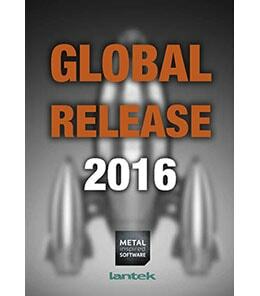 Lantek, the leader in sheet metal software systems is launching the global release for 2016 of its Lantek Factory concept. The new version is inspired by sheet metal companies around the world producing parts for sheet metal, tubes and profiles for over 30 years. The new functionality takes producers closer to Industry 4.0 for advanced and agile manufacturing. Advanced automatic geometry recognition for multiple parts and dynamic lead in/out positioning reduces programing times, while the new Bevel 3D Designer allows interactive irregular bevel design in 2.5D. Part cost calculation has also been enhanced in compensation for head up/down times and sheet load/unload times. Cutting gains some improved strategies which optimize heat in the metal sheet during cutting, cut micro-joints at the end of machining, optimize hole destruction and, for punching, include specific strategies for special tools such as wheel or deburring. A new piercing strategy for thick materials, EcoPierce, saves both energy and time for thick parts. Lantek has introduced a complete new CAD toolbox for tube design to ease the design of tubes and the incorporation of machining features necessary for successful cutting. Capabilities include multiple shapes for tube ends and for text on tubes as well as enhanced machining features such as break holes, control of ordering and direction of cut, weld preparation and micro joints as well as verification and simulation of the process. Step by step, forward and rewind simulation give a true representation of the movement of the machine. To make this type of work easier, the software now supports 3D CAD formats from Autodesk Inventor, CATIA, SOLIDWORKS, Solid Edge, Parasolid, PTC Creo, Siemens NX and VDA. Additionally, it can also utilise Excel data presented in the correct format to define the tube. The extra CAD formats supported will make it possible to work with a 3D model adding any necessary machining features in the Lantek software. During the tube cutting process the system now has island management on common cuts to improve efficiency and, on 3-axis tube cutting machines, it has chuck avoidance and a triple contour cutting strategy. For 5-axis tube cutting machines the Lantek software can now support the Mazak FabriGear and has extra features such as automatic vector correction, turret and drilling tools management and dynamic cutting for thick H section parts. 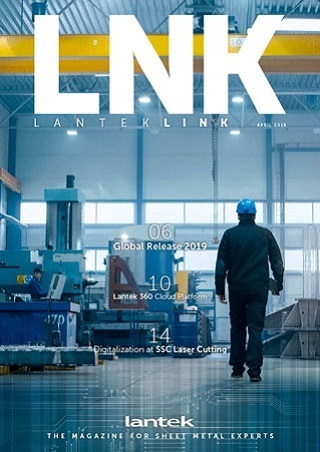 In the Lantek Workshop family of software new configurations enable the lag time between work centers to be checked, the arrival of outsourced work monitored and the working capacity by time limit examined. New visual tools let users see the estimated time sum for an execution date and get reports on the available capacity by work center. Lantek has also introduced a new web based version of Lantek Workshop Capture specifically designed for use on a tablet. By making data capture mobile, it will simplify and speed up the process and encouraging users to enter data reliably and make it easier for managers to review the current situation in the workshop from wherever they are. In Lantek Integra the company has improved the quotation stages of its ERP system with tools for calculating costs associated with operations and new dynamic pricing controls, which allow companies to apply different mark-ups according to commercial considerations or, if preferred, the capability for various methods of margin calculation. New quality assurance features keep track of returns including reasons for the return, replacement parts, credit notes and returnable packaging management. The traceability offered here helps to reduce the instance of returns and, for packaging, helps companies to maintain their obligations for recycling. Enhancements in REPLICA have improved system integration. The new Opentalk system makes it possible for a machine to send events in real time and transfer them to the management systems, while the Powersync system enables integration between Lantek software and the management systems already in place within a company, synchronising defined data sets to a specified schedule or on demand. The features in the latest Global Release will help companies improve efficiency, communication, cooperation and integration and give them some valuable tools for the implementation of Industry 4.0.